Pluredro blog: 1/12 Scale Dining Table Set Has Been Completed! 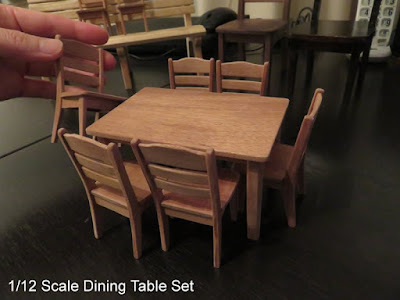 1/12 Scale Dining Table Set Has Been Completed! I made a 1/12 scale table yesterday. This table is for the chairs that I have made. 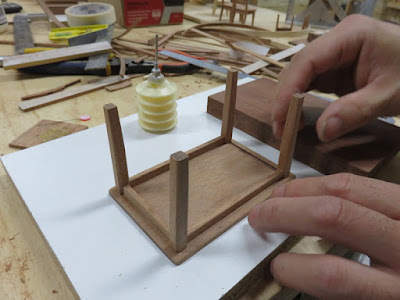 At the beginning, I had to find off-cuts for making the table but unfortunately there was no right thickness of off-cuts in our workplace. Juno found a little thicker timber and made it the right thickness using the planer for me. I think I was lucky that I could get the same timber of chairs "Util" (another name is Sipo Mahogany). 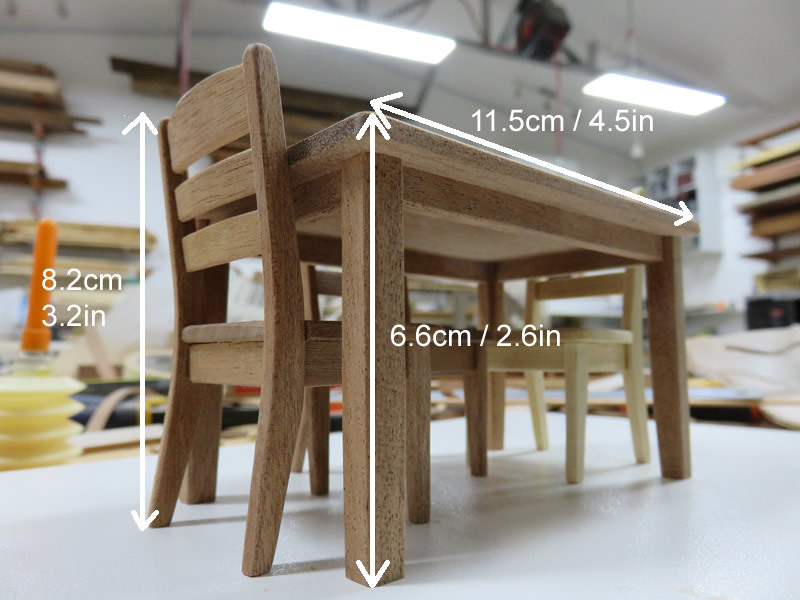 The next step was the same as I had made chairs, I exported the drawing of the table to DXF format and then imported the data to the other software and made the data for the CNC router. I'm not used to making the data and setting for the CNC router yet, and realised that there are many points that I have to be careful about. As you know, CNC routers are an automatic cutting machine which are controlled by a computer. I need to set up the coordinates, x, y and z. If I make mistakes for setting these coordinates, the milling bit (a kind of blade shaped like a drill blade) might hit or cut somewhere in the wrong place. Therefore, it's very important setting up the starting point accurately, you must instruct the machine where the x:0, y:0 and z:0 should be. After the setting of x, y and z or whatever is done, it's finally the time to start. 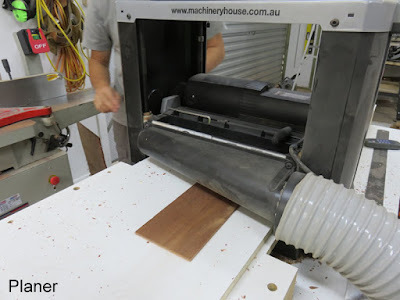 Switch on the motor for the water pump first, then switch on the CNC router. 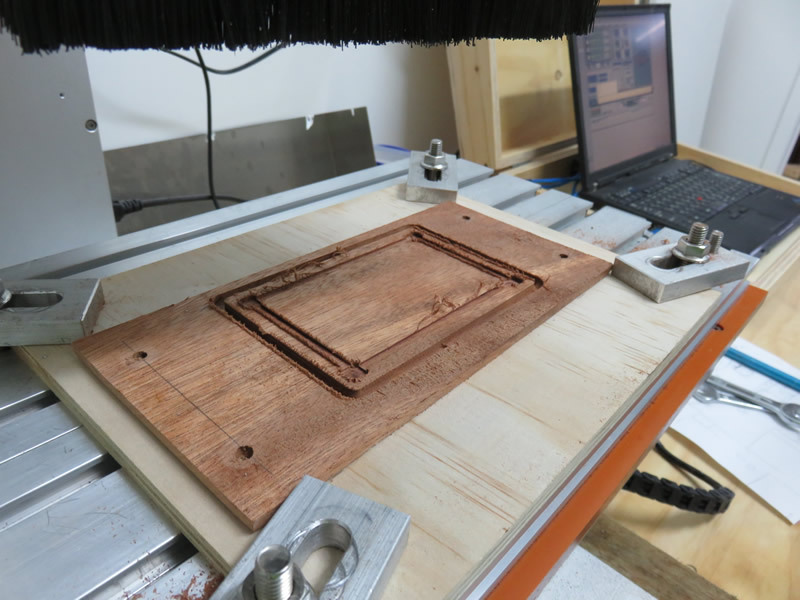 The water has the role to cool down the spindle motor of the CNC router. 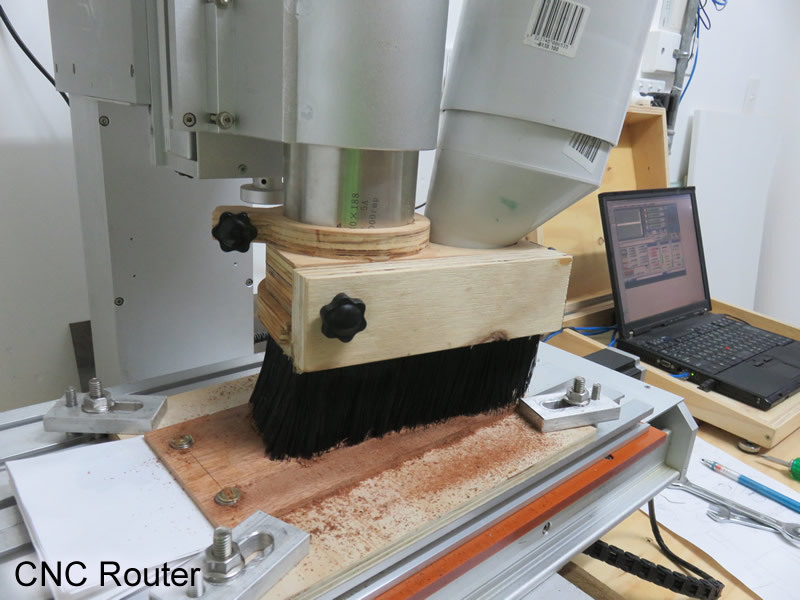 As shown in the picture below, Juno attached a dust boot on to the head of the CNC router. On the other side of the head, there is a pipe joint and it can be connected to the hose of the dust collector. Personally, I like watching the machine carving the timber, it's a little disappointing having the dust boot, but when we cut something small, I don't think we need the brush. Next to the CNC router's work, it's my turn, sanding the table top and legs. Honestly, this job was the most difficult one for me. The thick legs make the table stable but it doesn't look good. This time, I have made ordinary square-like table legs but next time (Yes, I'm going to make more chairs and tables) I would like to make different designed legs. This procedure is not only for sanding, I had to adjust the right size to the grooves under the table top. The puzzle master Juno helped me a lot, he made the curves of the legs nicely. The last step was a bit exciting, adjusting the legs, side aprons and end aprons. I glued all the parts under the table top and made sure that these legs stand 90 degrees. Until now, there was only flat timber and four short rods, but it became a table! It's exciting to see it has been completed. Furthermore, I'm so happy to see the table with chairs! I just remember the animation film "The Secret World of Arrietty." The story is about a girl named Arrietty and her family who live in a house secretly. As far as I could see in the animation film, their height seems to be 1/12 scale. If those tiny people in the film exist, they may love my 1/12 scale dining table set. 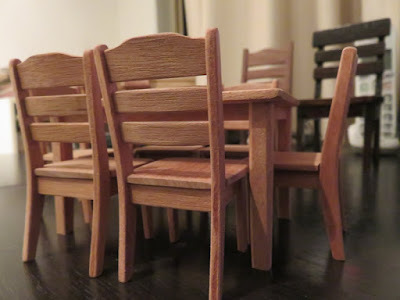 I'm going to make more Arrietty's size of furniture.